Austrian cuisine is not among the best in the World, but thanks to the extensive Habsburg Empire and its rich history, it is more diverse and rewarding than you might think. There is a neat blend of Hungarian spices, Italian creativity and Germanic culinary traditions. The Austrian standard cuisine was formlised in the early 19th century in Vienna, it is therefore generally referred to as "Wiener Küche" (Vienna Cuisine). Regional cooking traditions are less precisely outlined. Looking at traditional regional meals from the Salzburg area, there are two things that you should keep in mind: Firstly, as an Alpine province, ingredients tended to be plain and not particularly diverse; much of Salzburg cuisine was made by poor people who had to preserve food for long winters (think of cheese or smoked bacon and other meats). Secondly, Salzburg was a Catholic church state until the early 19th century. Therefore, monastic and religious references can be found in its cuisine (think of fish, which was eaten during lent). 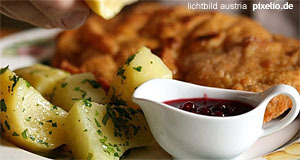 In the following articles, you can find recipes for traditional Austrian meals according to the Wiener Küche.